In addition to running the employee training programs for Quickservice, I have created Learning Management System (LMS) training portals for several of our most prominent clients. Among them, Dairy Queen, Mary Browns, and the success story for today: Tim Hortons. Each client training portal provides video training for client staff on the Quickservice iQtouch POS, the register system that they use to give you your daily beverages and breakfasts. 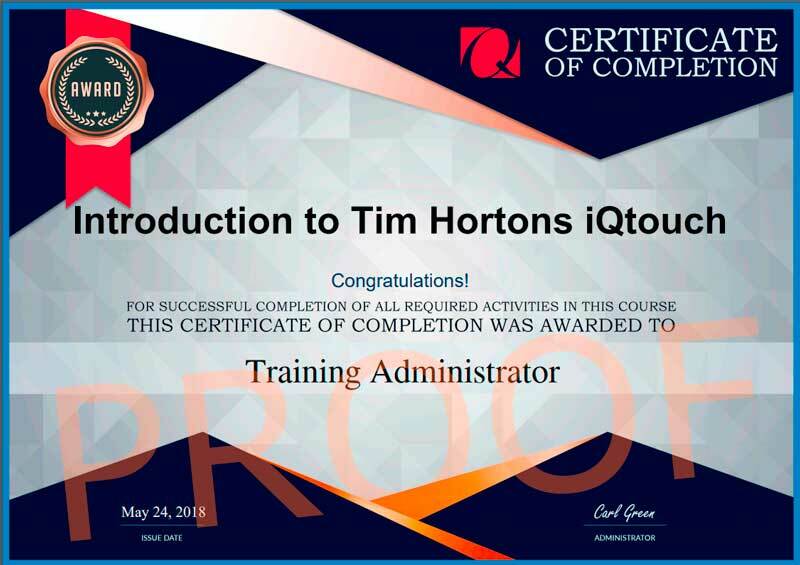 In the case of Tim Hortons, restaurant owners are given dedicated accounts with which to access their dedicated training portal. They simply direct their staff to step through the bite-size training videos at times most convenient to them. No disruption to restaurant operations. 24/7, on demand tuition. Faster and more user-friendly than a manual. Simple. And very, very effective. If you chose to bear with me for a few paragraphs, thank you. I’m parentally proud of this. For each client, I sat with our programming team and designed a training framework around the software features and ‘how to’ that their staff would need to know. Each portal required a different look and approach, as each POS implementation is customized to look and work according to the client menu, and method of operation. (Hey, we’re flexible, it’s the way we roll). Some offer delivery. Some have drive-thru. Some offer loyalty or discount cards. You get the idea. For each client, I wrote custom scripts around the training framework I had developed, for each of the videos that would follow. I worked with a hand-picked team to record the individual scripts to audio files (using my own voice for one series: I still don’t get royalties). The fun part? I needed to create Spanish and French versions for our bilingual portals. That required managing external translators, and re-cutting each video around the new audio, which of course was different length and cadence than the English. Challenge accepted. Met. Overcome. I recorded the visuals separately, using Camtasia to screen capture from virtual machines running the various client versions of our POS. I timed the visuals to the prerecorded audio to get the right flow, and make sure everything matched up. Camtasia allowed the easy addition of call outs and captions to reinforce the video and audio. We had the raw content. Now to bring it together. After exporting the videos from Camtasia, they were imported with the audio files and all were combined in Adobe Premiere Pro to create the masters and sequences needed for each client project. Production value was added via Photoshop and Illustrator, which I used to play the videos over a background graphic of a POS register in a restaurant, just as if the viewer were standing in front of it. A nice touch, that helps orient new employees. What they see is, quite literally, what they get. The finished videos were exported to compressed MP4 format, for maximum viewer compatibility and reduced file size. File size is important, we’ll come back to that shortly. Videos were uploaded to the servers I had prepped, one for each client portal, and additional HTML content written to present them. As mentioned, a couple of my portals are bilingual. Visitors can switch languages with a click, and choose the one they prefer to view the site and watch the videos in. Another nice touch. Challenge met. Side note, the same video content is repurposed and used to train our own employees on the differences between the various client implementations – the only difference is that our team are quizzed, and automatically receive certificates – singed by me – once they get passing grades. That’s a great way to ensure that our team and the client teams are both on the same page. But. Enough with the technical stuff. Back to the success story! There are, as I type, 637 accounts in the Tim Hortons training portal. Each account belongs to one owner. Each owner owns somewhere between (this is not breaking confidentiality to say) 1 and more restaurant locations. I guesstimate the average is somewhere around 3-5 locations, though I know many with more and at least one with over 30. But let’s start low. We can guesstimate around 637 x 4. Since launch, then, this portal has offered and managed POS training for an estimated 2,548 Tim Hortons restaurants across Canada and the U.S. Each restaurant location has, well, how many employees do you think they need to cover all those shifts? A lot. This is supported by the analytics. My traffic stats show the Tim Hortons training portal now averages between 2.5 and 3 thousand unique visits per month. Per month. Staff are being trained, on demand, around the clock. And those numbers are growing as I add new accounts each day. The traffic stats are corroborated by looking at the bandwidth used. Dividing bandwidth used by total file size (I said we would come back to that) tells you how much video was watched. This is not Internet background noise, or spiders, or bots. It’s real humans, watching videos. We really are rocking it. So much so, that I doubled the bandwidth cap on the server less than three months after launch. Earlier this week (prompting me to write this article) I was forced to double it again. We’re doubling bandwidth roughly every three months. That’s a lot of training videos being watched. In a nutshell, then, the Tim Hortons training portal is by all objective measures a complete success. It is proving a highly valuable resource both to our clients and ourselves. On the client side, they don’t need to close a restaurant for a ‘training day’, nor take valuable cash registers out of the loop for new employees to practice with. Staff can learn any time, anywhere, as groups or individuals. Even, BTW, on their phones. On our side, we have noticeably reduced incoming calls on basic POS usage, allowing our help desk team to focus more on actual customer issues. For new restaurants under construction we don’t need to ship a training register ahead, nor send a tech to demo the system. With the portal, everyone can be trained before opening day. Bonus, they can go back and review any time they need to. This has reduced some of the incoming calls to our help desk, reducing average call wait times overall. Call handling times are down a little too, as we now have the option, where appropriate, to direct simpler inquiries to the training portal: We’re teaching a man to fish. Everybody wins. But above that, this is a personal success story. I hate to boast (I really do), but in this case I think I can preen a little. I conceived these portals. I built them. I created all the content, for all of them, from scratch. I manage and administer the accounts. I maintain and run the servers, and keep the LMS updated and running. Me. Me. Me. All me. And every portal operates as smooth as the butter on your bagel. Never a hitch. I run a tight and well-buttered ship. Now there’s a mixed metaphor for you. The numbers here speak for themselves. I look forward to being forced to double that bandwidth again. We have the capacity, I built that in from day one. I look forward to adding extra courses, extra content. All to add to the value propositions we provide to our valued clients. To my knowledge, no other vendor in our space provides this level of service. It’s an honest to goodness USP. And I drove that bus. All the way. Yes, for this one you can colour me immodest. Or worse. Think what you will of me. I’ll take it, with a smile. I would simply say I’m proud. I think, on this one, justifiably. Anyway. Enough writing. I have a bus to drive. Disclaimer: Neither Quickservice nor Tim Hortons have endorsed this article. I wrote this, for me.